My last memory of a proper loaf of fergazza bread is hazy – I was with my parents, on Granville Island, and I can’t remember the circumstances or anything else about the day, but we bought a loaf from one of the bakeries there and they put it in a bag and for some reason the bag was handed to me and I ate the entire loaf while we were wandering around and then I didn’t poop for four days. It’s weird what lives on in the mind. Fergazza bread seems to be a local thing, or a Canadian thing, and not particularly common – you see it in the occasional bakery, but I’ve never seen a recipe for it and to be honest, I’m just guessing at the spelling. It’s not fougasse, though there are similarities. 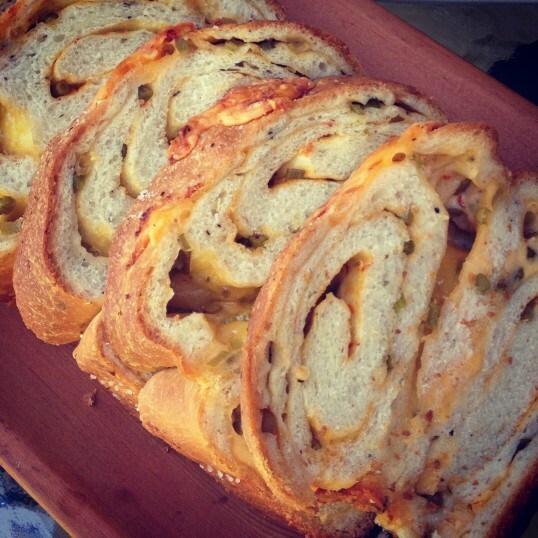 It’s a loaf of bread that’s crammed full of Cheddar cheese and green onions, with a herbs and a whisper of hot sauce. It’s wonderful toasted with a bit of butter, and you really could just mindlessly eat a whole loaf. Don’t do that, unless you’re prepared to have a lot more free time and a heavy abdominal sadness for a few days after. It’s pretty wonderful with green onions, and you could certainly use those if that’s what you have or if it’s not garlic scape season, but it’s garlic scape season right now so I’m just garlicking everything even more than usual – this might be my favourite application of garlic scapes yet. I’ve found that by adding just a bit of beer to the dough, the result is a bread that’s just breadier. You can omit it if you prefer – just replace with water, and put the full amount of liquid in with the yeast at the beginning. Combine water with sugar and yeast in a bowl and let rest for five minutes, until yeast is foamy. Add yeast mixture to flour, with beer, one tablespoon of olive oil, salt, oregano, and pepper. Mix until a shaggy dough forms, then knead for eight minutes or until the dough is smooth and stretches when pulled. Form the dough into a ball. Place it into a greased bowl, cover with greased plastic wrap and a dishtowel, and let rest in a warm, draft-free space until doubled in size, about two hours. Mix two tablespoons of olive oil with sambal oelek and garlic. Once the dough has risen, spread it out over a clean, floured surface. Using a rolling pin, roll it to about 10″x14″. Paint the oil-sambal mixture over top, leaving about a half inch border all the way around. 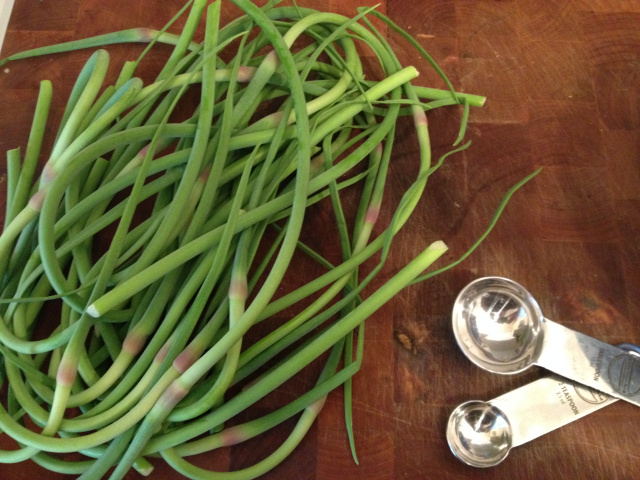 Sprinkle with garlic scapes, and scatter with cheese cubes. Form as tight and firm a roll as you can. Fold the edges of the roll under, then place into a greased 9″x5″ loaf pan. Cover again, and let rise another hour to hour and a half. Using a sharp knife, cut slits into the top of the loaf. Paint the top of the loaf with the remaining olive oil, and sprinkle with additional coarse salt. Bake for 45 to 50 minutes at 350°F. Check the bread halfway through baking – turn the pan, and if the loaf is browning too quickly cover it with foil for the remainder of your cooking time. Remove the loaf from the pan and cool on a rack for at least an hour before serving. mmmm yum…my menfolks will love this. 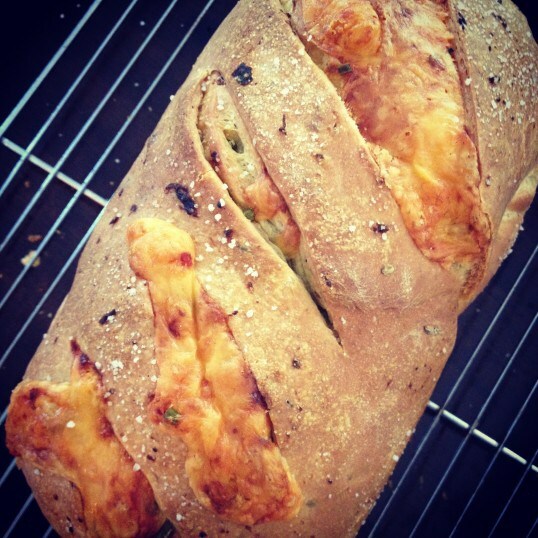 I love this… Every recipe in the blogosphere is for garlic scape pesto- this is so much more unique and delicious! !